Collaborating with your team on building a digital product doesn’t need to be a hassle. Sympli turns making of the visual specs and assets for handoff into one-click action, and here is how to use it with Sketch. First, download & install the latest version of the plugin here. After you restart Sketch, you can open Sympli in Menu->Plugins->Sympli->Export to Sympli, or by just pressing ⌘ + Y. At the moment, Sympli supports iOS, Android and Web projects (with more coming soon), and each type lets you select multiple resolutions. Select any element within the artboard you want to export on the canvas or in the layers tree, press ⌘ + Y and select the project. If you don't have any selection, all artboards in the current page will be exported. It’s as simple as selecting the layers or layer groups and clicking “Make Exportable” in the bottom right corner. Alternatively, you can make a Slice. You don't have to configure the scales and formats, any scale and format will be enough. Sympli will generate assets of all sizes automatically. To create an asset with transparent padding, place a Slice into the group and check “Export Group Contents Only” checkbox on it. This will tell Sketch to ignore all layers but those in the group. 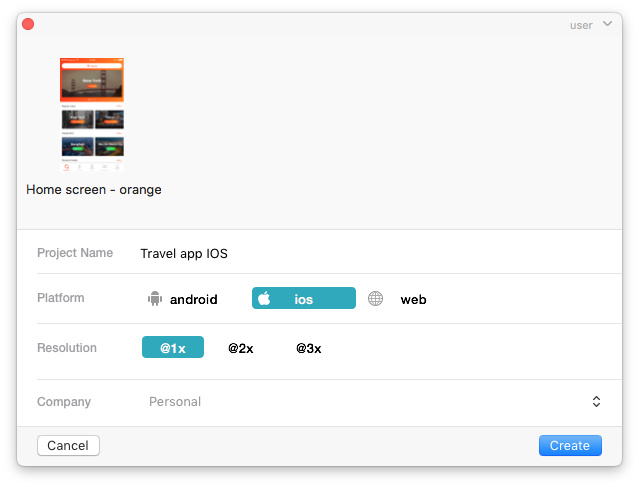 Group screens by flows or states with tags, right from Sketch! Activate tags view via Plugins -> Sympli -> Show Tags and add/remove tags. After you export the designs, you'll get a shareable link which you can send to your team's group chat. Or, you can invite teammates by email (you can add multiple addresses).